KUALA LUMPUR 15 August 2012 – Children should undergo eye examination every year from the age of four as vision problems among youngsters are on the rise in the country. An internationally recognised optomerist from The National University of Malaysia (UKM), Dr Rokiah Omar from the Faculty of Health Sciences (FSK) found the worrying trend from her studies on randomly selected kindergarten children in Sitiawan, Perak over a number of years. Her studies was to identify the causes of vision problems among preschool children. She said lack of health care, poor reading habits and watching at very close range for too long can damage eyesight in pre-school children. She said visual impairment can seriouly impact on a child’s social and mental development and an early detection is important to ensure a better prognosis for them. In her latest study on 479 kindergarten children aged between 4 and 6, they underwent visual acuity test, cover test, Hirschberg test, ocular external assessment and ophthalmoscopy. Of those tested 43 children failed the vision screening and another 32 (6.7%) were confirmed having visual problems. The main causes identified from the study was refractive error (4.8%) followed by amblyopia (1.0%), strabismus (1.0%) and ocular abnormalities (0.8%). In most cases, refractive errors represent a natural variation from normal vision and is not considered a disease. Refractive errors occur when there is a mismatch between the length of the eye, and its optical power. These mismatches usually originate during childhood, when the eyes are growing. The exact causes of refractive errors are still being studied but it is known that both hereditary and environmental influences can affect their development, Dr Rokiah said. There are four main types of refractive errors: Myopia, Hyperopia, Astigmatism and Presbyopia. Refractive errors can usually be corrected using spectacles or contact lenses. There are also surgical techniques which can be used to correct refractive errors. Myopia is also known as short sightedness and is a very common condition. Usually myopia begins to develop in the teenage years and may get worse over the following years. Research done by Chung in 1996 found that the prevalence of myopia among Chinese children in Malaysia aged between 6-12 years was 33% and it increased to 50% among those aged 13 to 18 years. For Malay children, it was found that the prevalence of myopia among children aged between 7-12 years was 8% and increased to 20% when these children were between 13 to 18 years old. Myopic persons do not see distant objects clearly. In a myopic eye, the light is focussed in front of the retina and so the image is blurred. Myopic persons see close objects equally as well or at the most slightly worse than a person with normal vision. 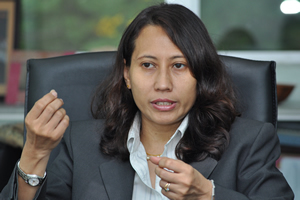 Dr Rokiah Omar received her Bachelor of Optometry degree from UKM. After completing her BOptom in 1990 she was employed as an Optometrist with a private practice in Kuala Lumpur before joining UKM as tutor in 1994. She obtained her PhD in Low Vision from University of New South Wales, Australia in 2002. She is a Fellow in Low Vision of the American Academy of Optometry, Fellow of Association of Malaysian Optometrists, Founding member of the Malaysian Academy of Optometry and Associate Fellow Academy of Science Malaysia. 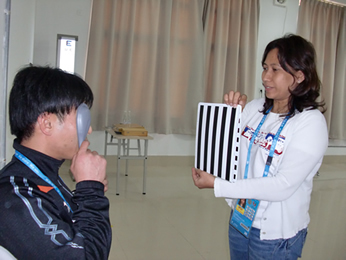 Dr Rokiah was the first Optometrist in the Asia region to be inducted as an International Blind Sports Federation International (IBSA) and International Paralympic Committee (IPC) Visually Impaired Classifier.